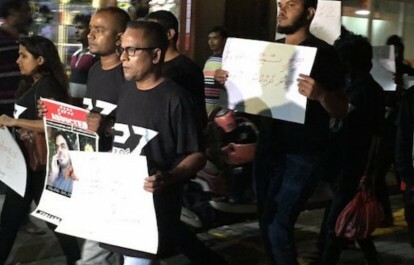 The new Anti-defamation Act in the Maldives serves to silence the media community which can face huge fines and imprisonment if found guilty of defamation. “… but after the law, I am not sure,” a blogger from the Maldives told me answering my questions about how long he would continue writing critically on the government. The law he was referring to was the Anti-Defamation and Freedom of Expression Act, passed by the Maldivian parliament on August 9, 2016, despite widespread criticism. Every conversation with anyone who writes opinions on public issues – journalists or bloggers or social media users – the law was mentioned as a sword hanging over their heads. The new law is a direct threat to the freedom of opinion and expression for Maldivians, who now fear that they could be slapped with huge fines huge and jailed for their words published in the media or even on social media. The law criminalises defamatory speech, remarks, writings and actions and also empowers the state authority to shut down media for its ‘defamatory’ contents. The law includes a fine between MVR 25,000 (USD 1,621) to MVR 2 million (USD130,000) or up to six months imprisonment for media houses found guilty of slander, remarks or content that threatens national security or breaches social norms. Individuals found guilty face fines between MVR50, 000 (USD 3,242) and MVR150, 000 (USD 9,727), while a decision can only be appealed once the fine has been paid. “That’s huge amount. If I am to pay, I will become poor,” a Maldivian friend told me looking at the blue water of the Indian Ocean that surrounds Male, an island, so small that you can go around it in less than an hour on a motorbike. Dhi TV, the Maldives’ first private TV station, shut down at midnight on August 10, after giving a short notice to the staff. DhiFM, a radio station affiliated with the TV station, DhiFM plus, and the Dhivehi Online website were also shut down. A memo on shutdown stated that the channels cannot be run in a sustainable manner under the current circumstances. CEO Midhath Adam did not spell it out, but pointed out that it would be huge risk for the owners to continue broadcasting due to the law. The Maldivian media landscape consists of online, radio and television. The state-owned Public Service Media runs a couple of TV channels and three radio stations. There is just one printed newspaper, Mihaaru, a new daily run on the strength of journalists mostly drawn from oldest newspaper Haveeru, which was closed down by court orders due to ownership issues in March, 2016. The local council elections are scheduled for January 2017, and the presidential election due in 2018. With issues such as politics and corruption high on the agenda, it would have been the right time for the Maldivian media, bloggers and citizens to openly discuss and express their opinions, but that is not likely to happen due to the fear of misuse of the draconian defamation law which represents a serious threat to people’s exercise of the democratic right of freedom of expression.